Upon launching the app, users are presented with a greeting depending on the time of day in the "My Watch" menu. 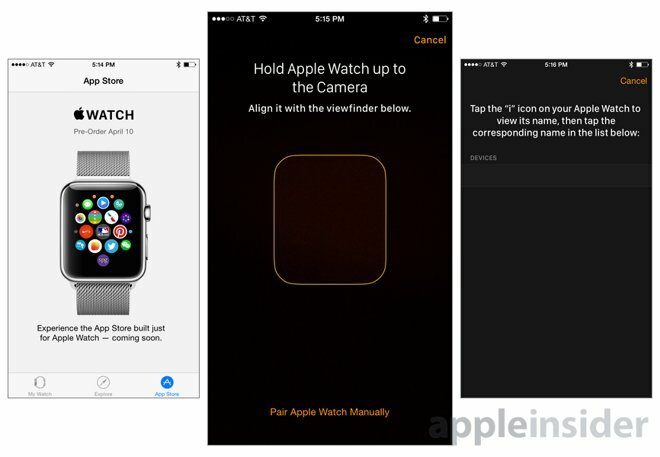 Images of the Apple Watch are shown above a "Start Pairing" button, or users can access a quick link to the Apple Store to learn more about the device. Interestingly, the Apple Watch appears to have a convenient camera-based pairing method. By default, the application asks users to hold their Apple Watch up to their iPhone's camera and align it with a viewfinder shown on the screen. For those who don't want to use the camera-based method, Apple also offers a manual pairing mode. This requires users to tap the "i" icon on their Apple Watch to view its name, and then manually enter the name into the app. Of course, with the Apple Watch hardware not available to the public until April 24, the pairing mode cannot be tested yet. 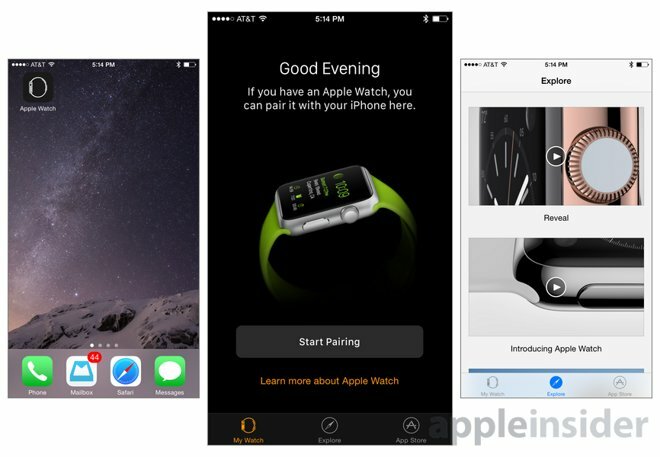 The application also includes an "Explore" menu, which features three videos showcasing the Apple Watch. The videos are entitled "Reveal," "Introducing Apple Watch," and "Health and Fitness." The third and final menu in the Apple Watch app is the App Store. This is where users will download and install Apple Watch applications on their iPhone, which are then automatically pushed to the wrist-worn device. Since the hardware is not yet available, the App Store is not yet online. Apple has simply included a page with a picture of the Watch, noting that preorders begin April 10. The app also states that the new App Store, which has been built "just for the Apple Watch," is "coming soon." iOS 8.2 is now available to download through the Software Update option in the iPhone's settings application, and it can also be installed when connected to a Mac or PC through iTunes.